Our Christmas catalog is here and should be arriving on your doorstep any day! Browse through the pages to find our hottest new Christmas cards and gifts as well as Advent readings and resources. It’s never too early to get in the Christmas spirit! Also, don’t forget to check out our new online design software! You can be the designer and get the just the right look you want for your holiday greeting cards right from your own home. With personalized cards and envelopes sent right to your doorstep, you’ll be checking off your holiday list now and enjoying your Christmas later. This entry was posted in Christian Gifts, Christian Greeting Cards, Christmas and tagged Christmas, gifts, The Printery House on August 8, 2018 by Printery House. Religious Profession – What is it? First, I’d like to clarify the meaning of the term “religious profession.” It refers to an event, not a job. The reference is to making or “professing” vows as a way of committing to a religious community. This usually occurs in a formal ceremony. It may also include the giving of a new name. Think of it like marriage. The couple professes vows in a public ceremony. Then their family and friends recognize them as in a way being different people. They will celebrate the anniversary of this event as long as they both live. and fidelity to the monastic way of life. The way of life includes chastity and personal poverty by implication (and according to our Constitution). As further clarification, “religious” is used as a noun to refer to someone who has made the religious vows. “Profession” is used in this context as a noun referring to the event. To be explicit one could say “profession of vows.” In most uses, however, “profession” implies the vows just like “marrying” does. Furthermore, religious profession is not the same as ordination. In fact, we consider them two separate yet compatible vocations. Men as well as women profess religious vows. Men who do this are “brothers.” Professed women are “sisters.” If a male religious is also ordained a priest, the usual form of address is “Father” instead. Priests usually have pastoral and sacramental ministries. Brothers and sisters, on the other hand, are devoted to non-sacramental work and prayer. Both are vital to the life of the Church. This entry was posted in Christian Cards, Christian Greeting Cards, Religious Greeting Cards, Religious Profession, The Printery House Story and tagged religious profession on July 25, 2018 by Bro. David O.S.B..
​hope, gratitude, and especially joy. Sister Sophie can help you to brighten someone’s birthday with her soft, sweet humor. This entry was posted in Christian Greeting Cards and tagged Christian greeting cards, Sister Sophie, The Printery House on October 28, 2015 by Printery House. 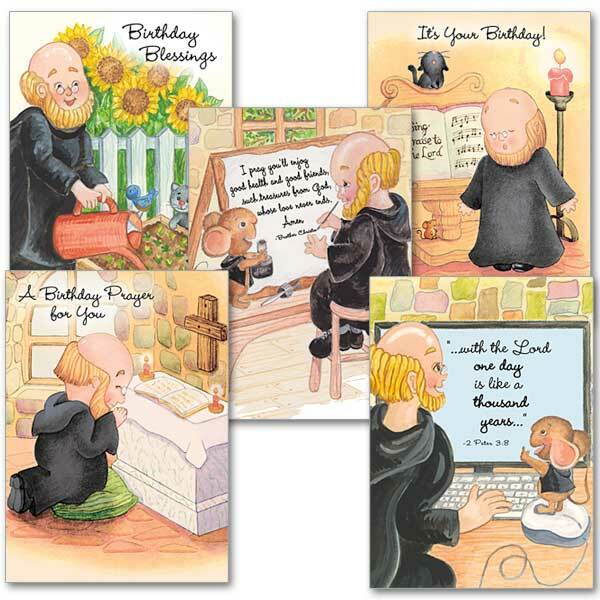 Meet Brother Christopher…one of our favorite characters featured on Printery House cards. He is a Benedictine monk who lives at the Abbey, where he does God’s work as a teacher, musician, and calligrapher. Brother Christopher loves all God’s creatures—especially a little mouse named Benny, who also lives in the Basilica. They met when Brother Christopher was practicing the pipe organ and one of the floor pedals stuck, making a loud bass sound. Benny came to the rescue and managed to wiggle under the organ pedal, just enough to release it. That was the beginning of a great friendship–and now Benny pounces on the organ pedals at just the right times to help Brother Christopher play hymns! When Brother Christopher writes cards using calligraphy, a specialty taught at the Abbey, Benny often dips his tail in the ink and adds a few words. If Brother Christopher is late for evening prayer, he’s just feeding and tending to all his little animal friends…especially Benny the Mouse. This entry was posted in Christian Greeting Cards and tagged Br. Christopher, monk prayer cards, religious greeting cards, The Printery House on August 5, 2015 by Printery House.